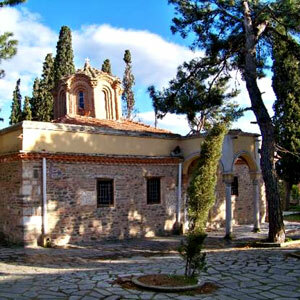 The walls were forming an almost square shape (trapezoid) and a height of 10-12 m and their northern part was connected to the walls of Acropolis. Today exist only 3 km of walls. During the Turkish occupation part of the walls were built with ordinary bricks. At some points there is still a small portion of a wall, called rampart which is within 4-6 meters from the main walls. The rampart facilitated to make it difficult for attackers to use, siege machines. In front of the rampart was a moat. The main wall was double and reinforced within certain distance, by towers and gates mostly in lowland areas, with the inner wall standing in a distance of 10 m from the outer “rampart”. Today there are only 60 towers. Everyone has a rectangular shape except the White Tower and the Triangle Tower. 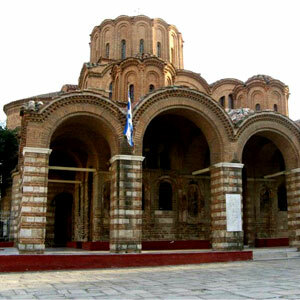 These two considered to have been built over older towers during the 15th century. At the sea section of the walls there were no gates, while inside the artificial harbor of Constantine the Great was a low wall on the side of the city and a breakwater, the “Tzerempoulon” on the side of the sea. 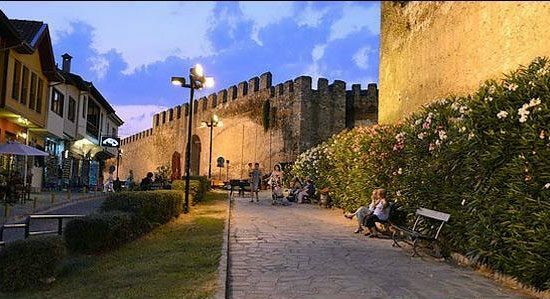 The major reconstruction of the walls was the early Christian period (late 4th-early 5th century) by Hormisdas since due to the frequent barbaric invasions of the 5th and 6th centuries the need for continued support of the walls, was a must. In the western part of the wall across from the cemetery of the Protestants, there is an inscription with the name of Hormisdas. The inscription includes three lines; each with a length of 9 meters and from these three lines only the second has survived in good condition and a few scattered letters from the third row. At the bottom of the inscription are clearly visible some Latin crosses. 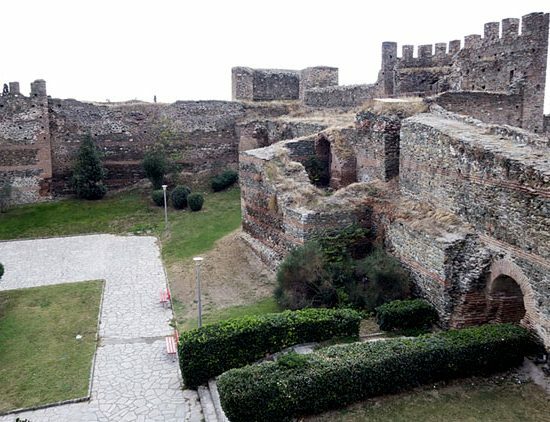 After the negligence that led to easy capture of the city by the Saracens in 904, the walls were strengthened again to confront the Bulgarian danger. 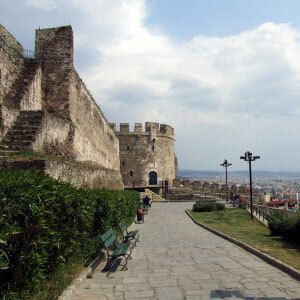 Major repair work was carried out in the 13th and 14th century by the family of Palaiologos in both the main walls (see, Anna Paleologina gateway) and the Eptapyrgio walls (Acropolis). 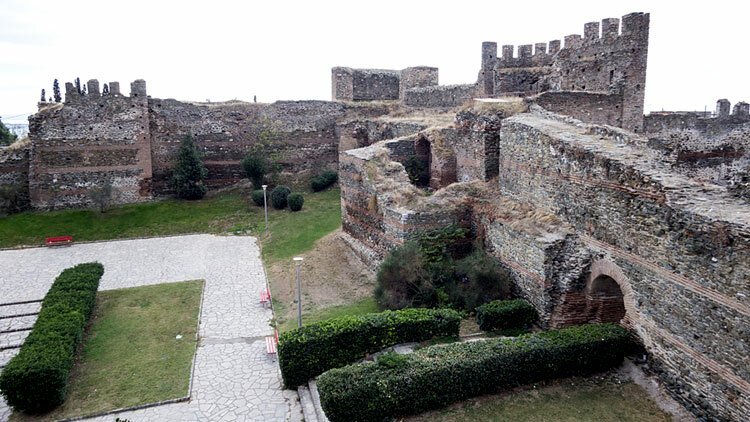 The lack of interest from the Venetians (1423-1430) to defend the city’s independence helped the Turks to capture Thessaloniki but after they conquered the city they fortified it, with great attention.